WESTMOUNT CLASSIC. 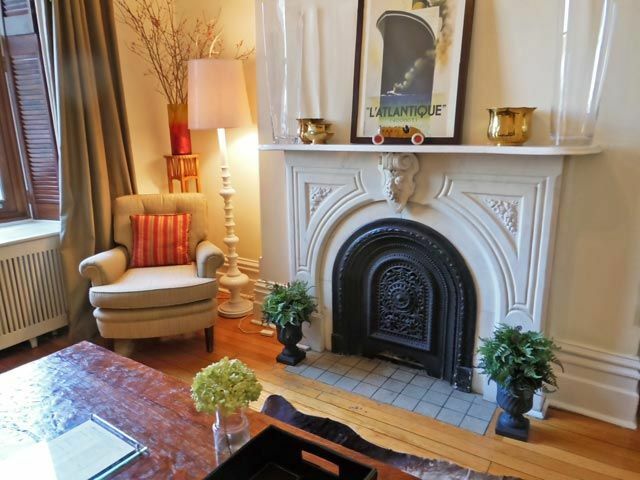 Luxury Westmont condo on 2 levels, working fireplace and large terrace overlooking a garden. Westmont location close to Atwater metro. Heart of downtown is reached within 15 min. Quiet neighborhood, tree lined street. Located on ground floor of 2 storey building part of a row of 19th century historic stone houses with garden in front and back. A fabulous sample of Montreal Bourgeois architecture. Newly renovated. A luxury condo decorated with taste and style. On ground floor you have a living room with fireplace, comfortable sleeper sofa (double), and a large flat screen TV. Tasteful touches everywhere. The living room can be closed to create a private space when the sleeper sofa is used. Two bedrooms, each with a queen size bed. Both face the back, and are completely quiet. Between the living and bedrooms is a study area, ready for a laptop with high-speed wireless (WI-FI) Internet access. A beautifully decorated working space. The terrace looks onto back yards and garden. Very relaxing, quiet and restful. A wonderful place to have breakfast or dinner and relax. On the lower level are the dining area (large enough for 6), kitchen and bathroom. Fully equipped kitchen with state of the art appliances, with a marble counter top. Large bathroom, with combined bath and shower. Indoor parking, garage space, available on demand for a fee. Close to everything: 2 minutes walk to the Atwater metro, 10 minutes drive to downtown (though easier to take the metro). In a few minutes you reach Old Montreal, the Plateau area, Mountain Street. Fabulous Green Avenue with its boutiques and restaurants is within walking distance. Just 20 minutes to Montreal's Trudeau airport. Nearby is the Atwater public market with all sorts of fabulous products from the farms around Montreal. Almost feels better than home! This upscale, historic home captured our hearts upon arrival. Greated by the hosts, shown around, we were situated quickly. The condo is spectacular, fully renovated with beautiful flooring, everything you could want in the beautiful kitchen, and access to laundry, a plus. Location is perfect, you can walk to get coffee, pastries, a variety of restaurants, the Metro. Took Uber to various museums and sights, most an $8 Canadian ride. Hosts were so helpful with recommendations, we had the best French meal. We highly recommend this condo, and would definitely stay at Westmount Classic again! Hello, thank you for your kind comments. We are glad you like the condo, the area and Montreal. Thank you for noticing we take great care of the apartment and also try to make sure our guests enjoy their stay. I hope we will see you again. The property is great. Clean, fresh and comfortable. Location is wonderful; walking distance to station, bus stops, mall and restaurants. Hosts were organized with information for us, available with just a call, and made us feel at home. Great people. I would recommend this spot. Thank you Philippe and Martin, hope skiing was good. From location to amenities, this is the place to stay!! A fabulous comment. Thank you. Gorgeous designer renovated townhouse!! This is a beautifully maintained and conveniently located home away from home. The hosts Martin and Patrice are extremely helpful and asked every day if we’re comfortable and if there’s anything we need. We stayed for a long weekend to visit our daughter who’s in college in Montreal and felt like we had our own little house to ourselves. Also we where surprised at how quiet it was during our stay.Truly very relaxing and very private. This US family highly recommends the westmount classic! I am so glad you liked the apartment and the area and its location. We take great care in maintaining and improving the apartment. We also want to be sure you find with us a home away from home. And thank you for taking the time to write a review. I hope you reached home safely. Marty & Phillipe were very helpful ensuring our arrival and departure went smoothly. The home is nicely appointed and the location is absolutely perfect close to shopping, transportation and entertainment. The kitchen was well stocked with cooking and dishware and I found that to be greatly helpful. All-in-all a nice experience and highly recommended. Thank you for taking the time and for your kind words.We often renovate the house to make sure it is up to our guests standards and more. Very comfortable and to sum it up home away from home. I am glad you enjoyed your. We do try to make it a home away from home.